Altitude: Between sea level and 610 metres. Habitat: Coastal lowland and inland in gulches in open dry to moist forests. At sea level, they are found in groups around brackish water ponds near mangrove formations. 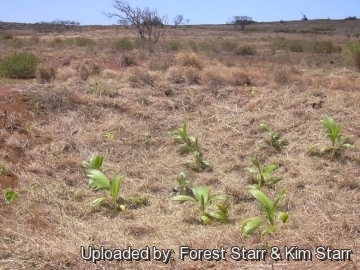 The original natural habitat of this species is unknown as it was cultivated by Hawaiians who spread the plants prior to western contact, and it is still planted today. But some evidences suggests that it was endemic to Kona, which means that it originated here and until its seeds or plants were transported elsewhere. It was for a long time considered extinct in the wild and only a few plants existed in botanic gardens or in cultivation, but recently about 60 natural trees within 8 populations has been rediscovered in the wild scattered in the Kohala Mountains and along the western and south eastern coasts of the Island of Hawai‘i. These specimens are now probably more than 100 years old. It is threatened by rats and pigs, which damage the trees. Pritchardia affinis var. gracilis Becc. Pritchardia affinis var. holaphila Becc. Pritchardia affinis var. rhopalocarpa Becc. 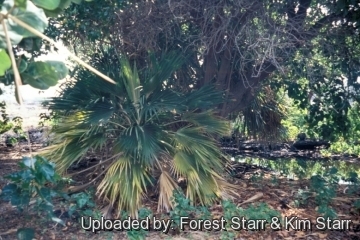 Description: Pritchardia maideniana is a fine looking, medium sized solitary fan palm. It is a long-lived species that distinguish among its fan palm relatives by its soft feathery tips. The only other Pritchardia with similar leaves is Pritchardia schattaueri. It is quite variable. Trunk: Single, very erect, 10-15(-25?) m tall. Leaves: Costapalmate (wedge-shaped), forming one third to half of a circle, only slightly divided relatively narrow compared to the most popular species like Pritchardia pacifica, glabrous above,covered underneath with a few scattered scales. Segments (leaflets), pleated, single-fold, with soft feathery tips, that don't droop much, if at all. Petioles with pale or pinkish coloured soft wool extending from under the petiole along the segment folds. The leaf sheath breaks down into a mass of tawny fibres. Flower: Three-petaled, creamy white, arranged in branched hairless panicles located among the leaves. Fruit: About 24 mm diameter, greenish (immature) to brownish or purplish-black when ripe. The immature fruit smell and taste like coconut and is edible. Seeds: 16 mm in diameter. Note: The flowers and fruit are similar to Pritchardia hillebrandii, but the seeds are larger. 1) Forest & Kim Starr Pritchardia maideniana (Loulu). Plants of Hawaii. <http://www.starrenvironmental.com>. Downloaded on 21 August 2014. 3) Donald R. Hodel "A Review of the Genus Pritchardia", pages S-3, S-8, S-10,S-26-27. 5) Diana Duff "The Incredible, Edible Pritchardia"in West Hawaii Today (April 1, 2012). 6) Donald R. Hodel "Loulu--The Hawaiian Pritchardia", The Palm Journal 193, page 12. 7) Garrett Webb "Protecting Kona's Vanishing Pritchardia" in Hawaii Landscape (April/May 2012), page 26. 8) Wikipedia contributors. "Pritchardia affinis." Wikipedia, The Free Encyclopedia. Wikipedia, The Free Encyclopedia, 17 Mar. 2013. Web. 3 Sep. 2014. 10) Donald R. Hodel "Loulu-The Hawaiian Pritchardia" in the: The Palm Journal 193, page 12. 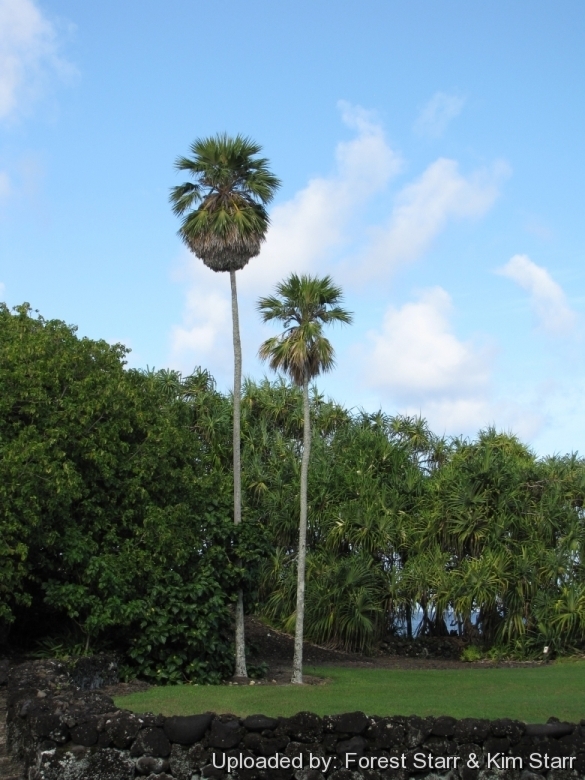 12) David Leaser "Growing Palm Trees in Hawaiʻi and Other Tropical Climates"
13) Gemmill, C. 1998. Pritchardia affinis. The IUCN Red List of Threatened Species. Version 2014.2. <www.iucnredlist.org>. Downloaded on 04 September 2014. 15) Wagner, W. L., Herbst, D. R., and S. H. Sohmer. 1999. "Manual of the Flowering Plants of Hawai‘i." Revised Edition. Volume 2. Bishop Museum Special Publication 97. University of Hawai‘i Press, Bishop Museum Press, Honolulu, Hawai’i. Cultivation and Propagation: Many Pritchardias are fussy and difficult to grow outside the tropics, frequently suffering from a yellowing of the leaves, but Pritchardia maideniana is a pretty robust grower, very modest in its requirement. It relatively slow growing and vary in shape. Specimens raised in dry and/or infertile soils tend to be smaller in stature with smaller leaves. Light also affects the plant's form while those grown in full sun are more compact. Soil:It grows well in sand, cinder or organic and well-drained soil, but is adaptable to clay and loam both slightly alkaline and acidic. Fertilization: Need a perfect fertilizer diet including all micro nutrients and trace elements or slow release fertilizer. Micronutrient deficiencies are occasional problems. Fertilize often for faster growth. Potted or younger loulu planted in the ground appreciate a foliar feeding monthly or bi-monthly. Water Requirements: It tolerates low levels of humidity, though it prefers evenly moist but not consistently wet medium. When supplied with adequate moisture and fertilizer it is also fairly fast growing. This palm is very drought tolerant once established. Water young plants for healthy look and fastest growth. Hardiness: It is adapted to tropical and subtropical climates but tolerate a wide range of climates and will even tolerate cool conditions; they should be grown in cold green houses or at least in a place where they are sheltered by the wind; However mature specimens can endure temperatures down to about -0°C ( or less for short periods), while young plants are more cold sensitive. Best kept above 10° C.
Wind and salt tolerance: It does very well in low elevation landscapes tolerates seaside conditions and salt spray. 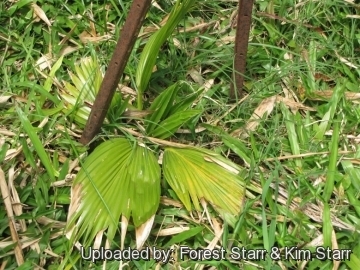 With a particularly windy climate it is suggested to secure young palm to long solid stakes, to avoid that the wind could bare young and not very developed roots; specimens which are only a few years old might fear intense wind, but as it becomes a tall palm it can look ratty after the winds. Food use: The young fruits called hāwane or wāhane are small with a single seed, edible and tasty; the soft interior can be eaten raw after being peeled or used to add a coconut flavour to other dishes. The flavour of fruit with the is similar to coconut. Ornamental: It is cultivated as an ornamental tree, and planted in gardens and parks in tropical and sub-tropical climates either as a single specimen in small groves of three or more palms. Culture in containers is possible although growth rates are slower. A bright patio will provide an excellent environment for young specimens which can eventually be planted in a sunny location. Propagation: Sow mature fresh seeds buried half way in pot of clean, well drained potting soil, with bottom heat and water daily. The seeds may take 2 or 5 months to germinate, and they may spend up to two years as small seedlings before beginning to grow into mature plants, plants of 30 cm can be put in ground/larger pot; The seeds are not known to store well, but can eventually stored in the refrigerator, but should be planted soon after collection. You can also store the seeds in a plastic baggie with damp peat moss and they will eventually sprout. Patience is required in Pritchardia propagation. 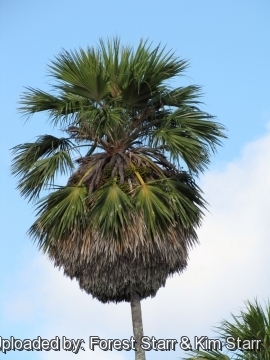 these palms easily hybridize with other Pritchardias, claiming a specific species requires seed collection from wild populations.